2673001 FE12R FIAT-ALLIS FE12R Wheel excavator Spare parts catalog. Operation and maintenance manual. Service/Repair manual. 2673003 FE18R FIAT-ALLIS FE18R Wheel excavator Spare parts catalog. Operation and maintenance manual. Service/Repair manual. 2673005 FE12 FIAT-ALLIS FE12 Large crawler excavator Spare parts catalog. Operation and maintenance manual. Service/Repair manual. 2673006 FE14 FIAT-ALLIS FE14 Large crawler excavator Spare parts catalog. Operation and maintenance manual. Service/Repair manual. 2673007 FE18 FIAT-ALLIS FE18 Large crawler excavator Spare parts catalog. Operation and maintenance manual. Service/Repair manual. 2673009 FE20 FIAT-ALLIS FE20 Large crawler excavator Spare parts catalog. Operation and maintenance manual. Service/Repair manual. 2673011 FE24 FIAT-ALLIS FE24 Large crawler excavator Spare parts catalog. Operation and maintenance manual. Service/Repair manual. 2673012 FE28 FIAT-ALLIS FE28 Large crawler excavator Spare parts catalog. Operation and maintenance manual. Service/Repair manual. 2673014 FE40 FIAT-ALLIS FE40 Large crawler excavator Spare parts catalog. Operation and maintenance manual. Service/Repair manual. 2673015 FE40L FIAT-ALLIS FE40L Large crawler excavator Spare parts catalog. Operation and maintenance manual. Service/Repair manual. 2673016 FX130 FIAT-ALLIS FX130 Large crawler excavator Spare parts catalog. Operation and maintenance manual. Service/Repair manual. 2673019 FX140 FIAT-ALLIS FX140 Large crawler excavator Spare parts catalog. Operation and maintenance manual. Service/Repair manual. 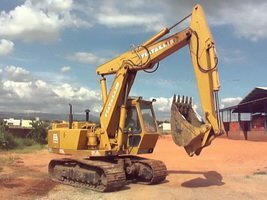 2673020 FX140LC FIAT-ALLIS FX140LC Large crawler excavator Spare parts catalog. Operation and maintenance manual. Service/Repair manual. 2673021 FX200 FIAT-ALLIS FX200 Large crawler excavator Spare parts catalog. Operation and maintenance manual. Service/Repair manual. 2673022 FX200LC FIAT-ALLIS FX200LC Large crawler excavator Spare parts catalog. Operation and maintenance manual. Service/Repair manual. 2673023 FX200LC Phoenix series FIAT-ALLIS FX200LC Phoenix series Large crawler excavator Spare parts catalog. Operation and maintenance manual. Service/Repair manual. 2673026 FX210 FIAT-ALLIS FX210 Large crawler excavator Spare parts catalog. Operation and maintenance manual. Service/Repair manual. 2673028 FX210LC FIAT-ALLIS FX210LC Large crawler excavator Spare parts catalog. Operation and maintenance manual. Service/Repair manual. 2673029 FX215 FIAT-ALLIS FX215 Large crawler excavator Spare parts catalog. Operation and maintenance manual. Service/Repair manual. 2673030 FX250 FIAT-ALLIS FX250 Large crawler excavator Spare parts catalog. Operation and maintenance manual. Service/Repair manual. 2673033 FX270LC Phoenix series FIAT-ALLIS FX270LC Phoenix series Large crawler excavator Spare parts catalog. Operation and maintenance manual. Service/Repair manual. 2673035 FX300LC Phoenix series FIAT-ALLIS FX300LC Phoenix series Large crawler excavator Spare parts catalog. Operation and maintenance manual. Service/Repair manual. 2673037 FX310 FIAT-ALLIS FX310 Large crawler excavator Spare parts catalog. Operation and maintenance manual. Service/Repair manual. 2673040 FX350LC Phoenix series FIAT-ALLIS FX350LC Phoenix series Large crawler excavator Spare parts catalog. Operation and maintenance manual. Service/Repair manual. 2673042 FX480LC Phoenix series FIAT-ALLIS FX480LC Phoenix series Large crawler excavator Spare parts catalog. Operation and maintenance manual. Service/Repair manual. 2673044 S11 FIAT-ALLIS S11 Large crawler excavator Spare parts catalog. Operation and maintenance manual. Service/Repair manual. 2673045 S15 FIAT-ALLIS S15 Large crawler excavator Spare parts catalog. Operation and maintenance manual. Service/Repair manual. 2673046 S15B FIAT-ALLIS S15B Large crawler excavator Spare parts catalog. Operation and maintenance manual. Service/Repair manual. 2673047 S160 FIAT-ALLIS S160 Large crawler excavator Spare parts catalog. Operation and maintenance manual. Service/Repair manual. 2673048 S9 FIAT-ALLIS S9 Large crawler excavator Spare parts catalog. Operation and maintenance manual. Service/Repair manual. 2673049 S90 FIAT-ALLIS S90 Large crawler excavator Spare parts catalog. Operation and maintenance manual. Service/Repair manual. 2673050 SL11 FIAT-ALLIS SL11 Large crawler excavator Spare parts catalog. Operation and maintenance manual. Service/Repair manual. 2673051 SL9 FIAT-ALLIS SL9 Large crawler excavator Spare parts catalog. Operation and maintenance manual. Service/Repair manual.